When we think about coconuts in America, we probably think about coconut desserts and the new fad of using coconut oil in our diets as well as our beauty products. However, the use of the coconut goes far beyond our fads. Prior to working at the Virginia Tech Office of Economic Development (OED), I volunteered with the Peace Corps as a Community Economic Development Volunteer. My counterpart organization in the Peace Corps was a cooperative working to leverage coconut production in their region of Costa Rica by selling coconut products such as coconut oil, coconut chips, and coconut jewelry. The cooperative was always looking to expand their products to use all parts of the coconut to operate as sustainably as possible. There, I assisted in whatever tasks needed to be completed and sometimes that meant helping to process coconut. At the Office of Economic Development, I have been working with coconuts but from a different perspective. This summer at OED, I have been doing research and analysis about a relatively new integrated pest management strategy called coconut pith, also known as coconut dust and coir pith. Coconut pith is a by-product of the coconut fiber industry. The husks of the coconut are used to make fiber for rugs, mats, mattresses and other commodities. However, the coconut dust that is produced as a by-product is often dumped. For decades, coconut pith would sit unused and become an environmental threat to water sources and agricultural fields due to its high level of tannins and phenols. However, in the last 20 years, coconut pith, when decomposed properly, is now being used in organic farming, specifically as a growth medium. Nurserymen are using coconut pith as a substitute for peat moss to raise seedlings. OED has been commissioned to determine the economic impact of this integrated pest management (IPM) technology in specific regions of Bangladesh, Nepal, and India. My role in this project, as a graduate research assistant, has been to research coconut pith and the local agricultural economies of our target regions in Bangladesh, Nepal, and India. Initially, I conducted background research on the technology and compiled a literature review about the science behind the technology. Currently, I have been transcribing and qualitatively coding the results to gain a better understanding of how the supply chain for coconut pith functions and what benefits there are from adopting coconut pith as an IPM strategy as well as what are the drawbacks for adoption. In any case, we can already tell that coconut pith, once dumped by the coconut fiber industry, has prompted the emergence of a new industry. Stay tuned to learn more about what we learn about the economic impact of coconut pith in Bangladesh, Nepal, and India! 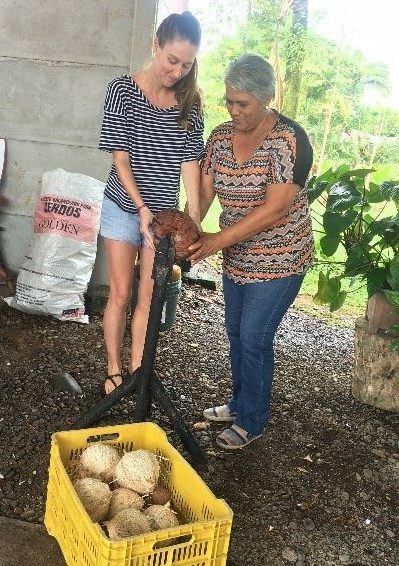 From collaborating coconut cooperative in Costa Rica to learning about how a by-product of the coconut industry is being used as a new agricultural technology, OED has given me the opportunity to keep learning about interesting and innovative technologies through an economic development lens.